With the fading of other types of hero, today we look to the CEO as a guide not just in business, but also in other areas of life. Why should we do this? While there are many varieties of corporate leader, their ability to mobilize a group of people with a sense of meaning and purpose, to harness and align human energy, and to make a concrete difference in an important area of life gives them credibility to speak to us. Chip Conley has these credentials having founded and developed one of the most successful boutique hotel chains, Joie de Vivre, with a culture of engaged employees, creativity and customer service. We want to bottle his wisdom and drink it deeply. While many corporate leaders move outward to share their message, Chip has taken a very different course, bringing him to Saybrook this year as a distinguished scholar practitioner in residence. Emerging from his leadership at a particularly difficult personal and professional period in his life, Chip took a deep inward journey influenced by two of humanistic psychology’s guiding spirits, Abraham Maslow and Viktor Frankl. Chip drew on their work to help him through his emotional upheaval. He shares insights from his personal journey out of depression and questioning of his life to greater self-awareness and clarity about his life purpose. He has a special talent for looking at what can become complex and ambiguous areas, such as emotions and personal meaning, and has developed simple (in a positive, useful sense) algorithms and tools to help guide others. He has evolved from a leader to a teacher as he moves into middle life. There are command and control leaders. There are charismatic leaders. And there are leaders who lead by their ability to harness employee’s energy, creativity and capability. As a result of his personal exploration, Chip has added to his tool kit as a leader an explanation of the role of personal and emotional development as a key element of deep leadership. His new book, Emotional Equations, is not about business (the topic of his previous book Peak), but about self-awareness as a tool for personal development. He integrates his wisdom from leading with those from his personal search to develop a model, or set of guiding concepts, and, most importantly, a process that can be used to help people to explore these issues themselves. It is simple but not simplistic—his equations help us gain clarity rather than oversimplifying and making personal experience into a cliché. Many CEO leadership manuals operate by denying struggle, pain, and challenge and act as if it is painless and easy to grow and change. Chip does not sugarcoat his optimism by making it seem to operate outside the realm of pain and struggle. It is hard, tough, and, sometimes, dispiriting work to change and grow. What he offers are not answers, but tools. We are all familiar with the concept of emotional intelligence and its importance in making one’s way in the world. Emotional intelligence (or EI), also know as emotional quotient (or EQ), is made up of qualities of internal emotional self-awareness and the ability to listen to and understand this reality in others. But awareness in each area is not enough, an emotionally mature and capable person must also be able to take meaningful action in relation to their inner and outer awareness. They must move from awareness to action in an emotion-laden world. Other psychologists (and Chip) are also aware that the emotions that we sense in ourselves and others are neither unitary nor consistent. As we poke the boundaries of awareness we come upon conflicting emotional conditions that raise more questions than they answer. Chip’s equations offer a tool to manage and make one’s way through emotional conflicts to set priorities and achieve resolution of difficult situations. He begins by looking at conflicting emotions as a pathway to self-management. He considers his experience as a CEO and the wonderful feeling of working in a positive environment, and then considers how energy can be diminished when the meaning disappears from work and life. 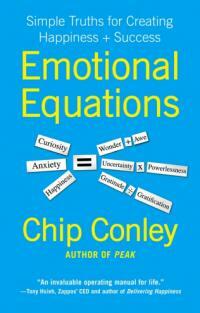 An equation is a way of looking at the relationships between key emotions. He presents the complex wheel of emotions and reflects on the insight that there are primary emotions, like primary colors, that mix and match to create greater and more nuanced varieties. Then he reflects on happiness, and its connection with good work and a good sense of self. He visits the work of Frankl who talked about how meaning can be a way out of suffering. He then looks at the relations between personal disappointment, the gap between reality and what we believe about ourselves—not new insights in themselves—but presents them using simple equations that have good face validity and enable us to look at pathways to move and shift our emotional makeup. His “method” of working with equations is deeply reflective. Indeed, this whole book is a set of frameworks for people to reflect on the challenges and even setbacks in their lives, and to find a way to move forward to greater meaning and purpose. He does not prescribe, but rather evokes and teaches a process. He presents a number of equations and his reflections on them, and then invites the reader to create his or her own. His prescriptions have to do with moving from a dream to taking responsibility for taking action to develop your ability to get there. He brings up the concepts of EI, flow, life purpose, personal responsibility, overcoming adversity, and personal resilience. For each one, he takes them as complex constructions that are made up of a series of elements in dynamic relationship. For each, creating an emotional equation is a form of deconstruction, enabling us to see the elements that make up that concept or complex emotional state. By looking at each element we are more able to see how we can develop that in our lives. The concept of authenticity, for example, combines two elements—self-awareness and courage. Then, in turn, authenticity is combined with invisibility (a difficult state that is something like leading from behind) and reliability, which makes up the larger state of integrity. As you can see, using these equations to look at building blocks and elements of big ideas can be a useful foundation for looking at how each of these make up your lives.